Clayton Birney of Arista Home Care Solutions was the recipient of the 2017 Esteemed Volunteer Award. The Alzheimer’s Association gave the honor for his work at the Walk to End Alzheimer’s. 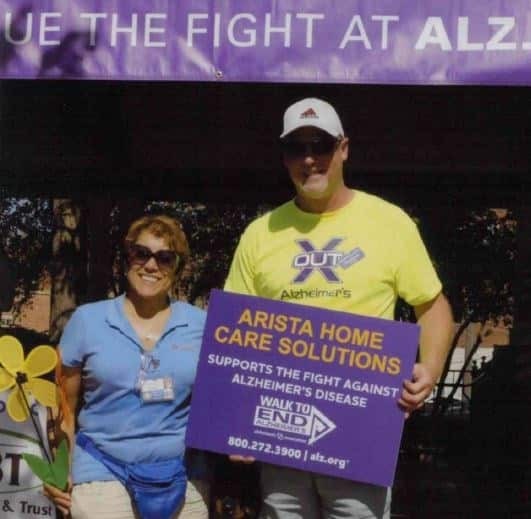 TOLEDO, Ohio — Clayton Birney, co-owner of Arista Home Care Solutions with his wife, Paula, took home the 2017 Esteemed Volunteer Award at the Walk to End Alzheimer’s recognition dinner, hosted by the Alzheimer's Association. The Alzheimer’s Association, Michigan Great Lakes Chapter, gave Clayton the award for his “outstanding efforts” and “devotion to those affected by dementia and their families” in the 2017 Walk. This year’s Walk to End Alzheimer’s took place on September 23 in Monroe, Michigan. It is the world’s largest fundraising and awareness event in support of Alzheimer’s research and care. Clayton served as the committee chair of Monroe County Walk this year and plans to do the same for the 2018 walk. Upon receiving the Esteemed Volunteer Award, Clayton thanked the Association and the community: “I am grateful to be in a position to invest my time and resources into giving back to our community. Alzheimer’s research has a place close to my heart, and I look forward to volunteering at the 2018 walk as well.” The Alzheimer’s Association is one of many groups and volunteer organizations that Arista Home Care Solutions is affiliated with, among others such as The DOVE Fund and Rotary Club of Maumee. Arista Home Care Solutions is a premier care provider that is family-owned and based locally in Ohio and Southeast Michigan. It is a client-first agency where the owners are personally involved in each and every case. Arista provides reliable, top-quality personal and companion care solutions, enabling clients to stay in their own homes longer. Arista offers: companion care, errand running, meal preparation, light housekeeping, assistance with bills, personal hygiene, and pet care.